The Post Office by Charles Bukowski. Ironically, I first heard about Charles Bukowski in Gilmore Girls. Paris: Typical guy response. Worship Kerouac and Bukowski, god forbid you pick up anything by Jane Austen. Jess: Hey, I've read Jane Austen. Jess: Yeah, and I think she would have liked Bukowski. I had heard of Jack Kerouac, but not Charles Bukowski. So I decided to read a book by him. 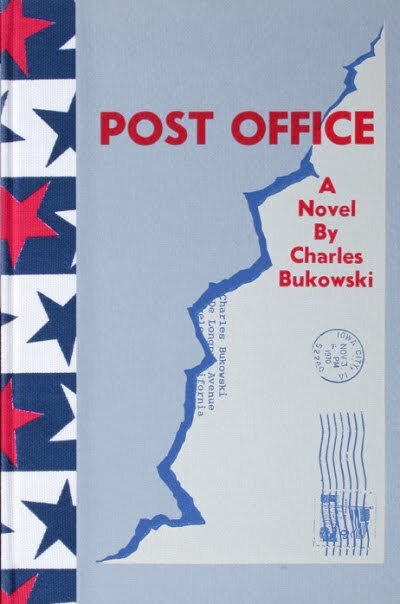 The Post Office is the story of Henry Chinaski, Bukowski's alter-ego, and his years working at the Los Angeles post office. He drinks a lot, sleeps around a lot, and well, he works somewhere in between all of that! He hates everything, including himself. It's a story about bitterness, distrust, cynicism and alienation. The book ends with a life changing moment, where Chinaski overcomes his urge of self destruction, and instead decides to write this book about his life. "In the morning it was morning and I was still alive. Maybe I’ll write a novel, I thought. And then I did." The book is written in a very unsentimental fashion, and ends that way too. The writing is very different from anything I have ever read before, ranging from utterly captivating to outright disgusting. What made me keep on reading was the fact that it was very amusing all along. Written in a simple diary-like fashion, the main character is as honest about everything as one can only be to oneself. It is very straight forward, and I guess only that kind of honesty could make you actually 'like' a character like Chinaski. Well, that and his sarcasm. You can only like this book if you are capable of taking your 'morals' and throwing them out of the window. The book is not about love or hatred, nor booze or women, for that matter - it's about life. And the life of a mail carrier, to be precise. And it's brutal. But you can still sort of make sense of it, it's like he's a sane madman. He repulses you most of the time, and he's crude and never talks about anything remotely emotional, yet there are those moments, when you realize there is much more to him than he says. It's a book about what circumstance can do to people. I can think of at least ten girl-friends of mine, who will read the first page of this book and look at me like I've lost my mind, some might even start ignoring me entirely! But, what the hell, this book is a must read, especially for most guys, and I'm glad I read it. you've actually read authors they refer to, in the Gilmore Girls? Quite an interesting plot!! Will add this to my to-read list!! Thats really looks lke an unusual plot.. Will look for it in the library..Thanks for the review! Thanks! It really is, do read it if you find it, I had to read the soft copy, unfortunately! Sounds good ! I'll buy this book then. Thanks. And, I like the cover page too ! You're welcome :) Do read it!! I know I like it too!